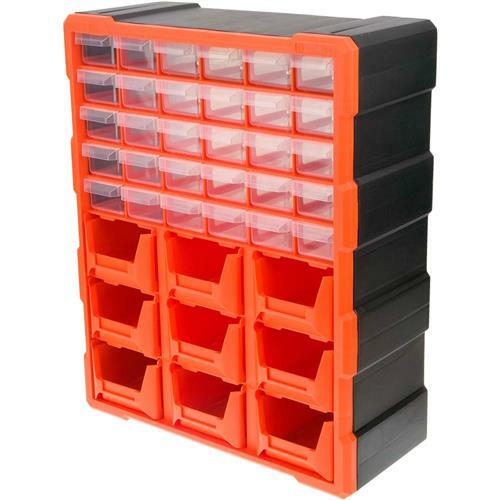 Perfect for organizing small parts and hardware, these Storage Bins feature see-through drawers, no-spill rear drawer tabs, and sturdy, lightweight construction. 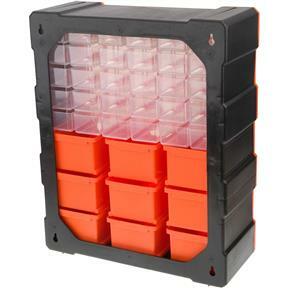 Ideal for all shop environments including assembly work stations. Each drawer has a removable divider and easy-grip drawer fronts. Overall size is 19" x 15" x 6-1/4"; each of these thirty drawers are 5-1/2" L x 2" W x 1-3/8" H; each of the 9 removable, stackable trays at the bottom measure 5-1/2" L x 3-1/2" W x 2-1/2" H.
I bought this storage bin about a month ago and find it fits the bill perfectly. I have lots of small pieces and items that need a place to live where I can find them quickly. This storage bin allows me to view the drawer contents with out opening the drawer and is strong and well constructed. I highly recommend and will buy another when this one gets full. 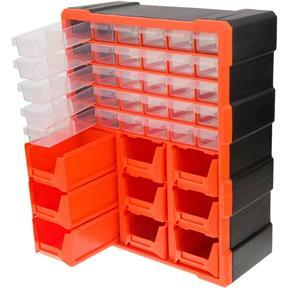 The drawers have dividers where the cheaper bins I have purchased did not. These are well made.